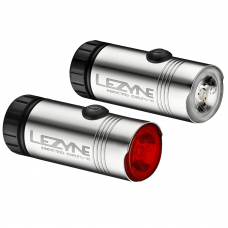 Commute / Road / MTB rechargable lightset. HECTO DRIVE SET is a serious every day and night safety light with enough front output to cover as a "get you home" light. Hecto's selling point is incredible value for a serious light package bringing added safety to every cyclist. High output white LED is mounted in custom Uniform Power Beam "MOR" lens for increased output efficiency. Frosted lens edge and "cut" Alloy body design improve side visibility. Compact size (30mm x 70mm). Lightweight (137g per set with brackets and straps). RGB Intellgent Power Indicator button acts as fuel gauge and charging indicator. Highly durable machined alloy body with composite back cap which removes to show integrated USB stick charge (no cables required). Built in high quality Lithium Ion battery (LIR123A). Click-fit composite universal handlebar and seat post brackets with durable patented rubber straps. Helmet mount accessory available seperately. Five modes: Economy and Blast solid modes, Three flash modes. Front Output rating: Economy 50lm; Blast 100lm; Flash modes 50lm. Rear Output rating: Economy 7lm; Blast 15lm; Flash modes 15lm. Burn times Front: 2hrs30min - 10hr depending on mode. Burn times Rear: 5hrs 45min - 12hr 30min depending on mode. Day or night...Ride safe, always be seen!